I made this recipe with my boys in mind. They’re coming home for the holidays, and of course they’ll be craving mom’s home cooking. Try feeding twin 21-year-old boys and your hubby a “quick” breakfast. It doesn’t happen. By the time I sit down, the boys are asking for seconds. Yes, I know they’re big boys and they can make breakfast for themselves, but since they live in different states now, I like to spoil them a little when they come home to momma. Plus they’re typical guys and liked to be waited on and I’m happy to play hostess. 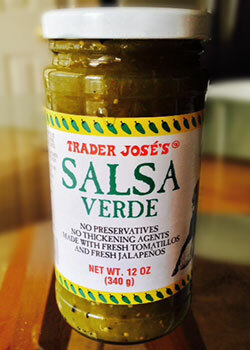 We used Trader Joe’s brand of Salsa Verde…but you can choose whatever kind of chili salsa you like. This spicy paleo egg bake recipe was the perfect breakfast solution for my hungry hombres. I baked the sweet potato the day before so it was ready to go. All I had to do was whisk the eggs, brown the chorizo and add a few other ingredients. The chili verde and coconut milk really makes the whole thing come together. If you’re not a big chorizo fan, no worries. Just substitute it with ground sausage and this dish will be just as good! I always talk about my hubby’s favorite recipes. He loved this one, but it is truly one of mine too! And of course it’s 100 percent paleo, as well as dairy and gluten-free. Enjoy peeps and let me know how you like it! Do you have a nutrition information for this? Not at this time Heather. I plan to make this tomorrow for my son and save the leftovers for lunch! Samantha, I live in Arizona and we have a local brand that has no additives. You might try Whole Foods or Sprouts if one is in your area, or an upper scale grocer. I did not have cooked sweet potatoes on hand so I grated some raw ones and it turned out perfect! Just made this … WOW … I loooooooove this. Yay Linda! FYI, it freezes well if you want to have it on hand for a grab and go meal. :) thanks for your comment! How long did you cook the sweet potato for? Like all the way? Thanks! Looks tasty! This is delish! We had this for Easter brunch! I’m a huge cheese-lover but have been eating semi-paleo with my bf who has been eating paleo for a while. I didn’t miss the cheese like I thought I would. It’s so moist and savory! Making this for the second time this morning. I added broccoli and shallots today! I have no patience and usually give a diet a week, lol! If I don’t see a difference after a week ill eat some cheese! This looks like a lot of work though…..
My friend Ariel Garcia Nevitt just recently told me about paleo diet . I’m afraid I’d miss my cheese and hummus but this looks good. I may have to give it a try. Yuummm! That’s what you had at work the other day!